Have you ever seen a quilt or a block or got an idea that you just could not let go? A week or so ago an idea took hold of me I could not shake it. I was cruising Pinterest, as you do, and saw some quilts with house blocks and fell instantly in love. 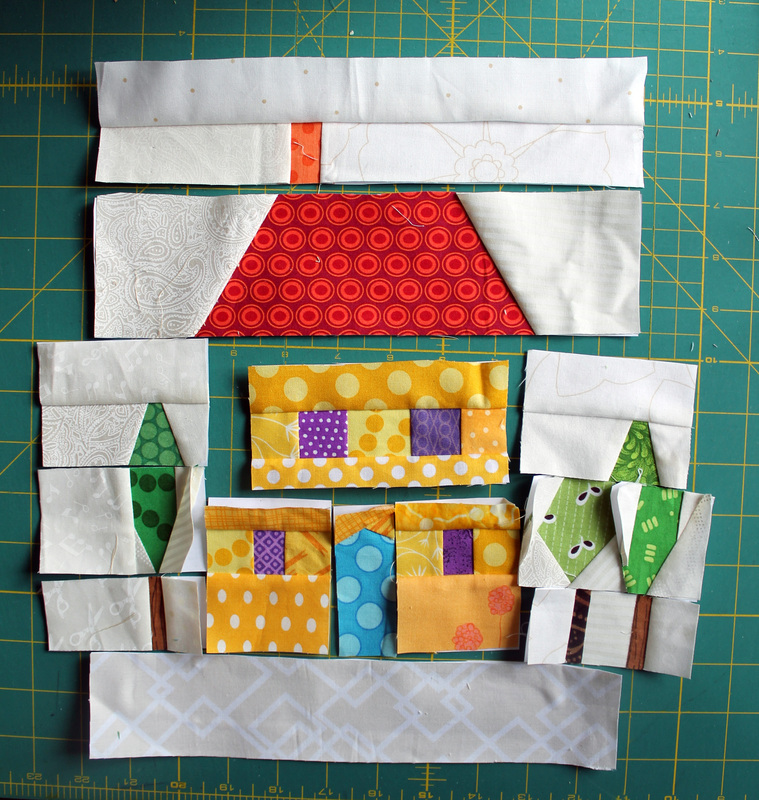 Now these quilts are not what usually excites me but for some strange reason I could not lose the urge to make house blocks. To my absolute delight I discovered that my EQ7 program had a few paper piecing house blocks in their library and I was off and running. For this first block I played with one of the patterns in the EQ library to make my own little house. It was a good exercise to see how the buildings come together and how the design process will work. I could design star patterns in my sleep but a house is something completely new. The block is 10 inches square, so there are no really little pieces involved and it was pretty easy to sew the 12 little block bits up. I raided my scrap bins for this project, which is always fun. Aw that is darling! Our old house was a two story house, it would be cute to make a little wall hanging in memory of it. I must admit my other house designs are inspired by places I have lived. 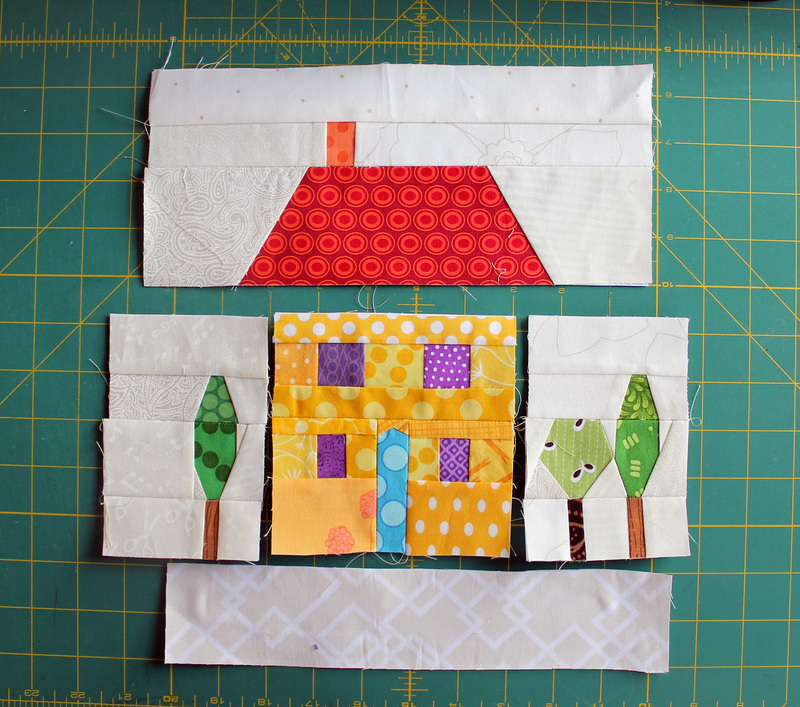 There is something fun and nostalgic about making blocks inspired by your real homes. Are you having a wonderful time? I am hoping you are having a blast. Maybe my village needs a beach house. Very cute! I may have to try some! Utterly delightful and so cute! how exciting! I love your house blocks!! i saw your pins and got so excited! i love love love house blocks and yours is adorable! i can’t wait to see your finish! My pinning activity definitely was full if houses last week. I am loving your Medallion pins too. There really is not enough time to make all the quilts we love and pin. I love that you get obsessed and share that on your blog. Happy house hunting. It is so much more fun if you share your crazy obsessions, I think. What a fun little house. I especially love the oval elements for the roof – clever! I want to make some houses too! Amanda you have to make done houses. They are so much fun and can be as simple or complex as you want. Plus I have seen some really fun ones that play with novelty prints.. I know you have some fun fabrics in your collection. Super cute! I’m so lazy though, I will probably stick with wonky houses and admire your elegant ones! Oh I love a good wonky house and maybe it could be a good Charity block. I want to do some modern house blocks! I can’t wait to see your baby quilt! Love little houses and those trees are adorable! I love this house!! The trees are so cute, I feel like they make the house! I’m definitely going to have to try some mini houses now–thank you for the inspiration!! Oh, how fun! 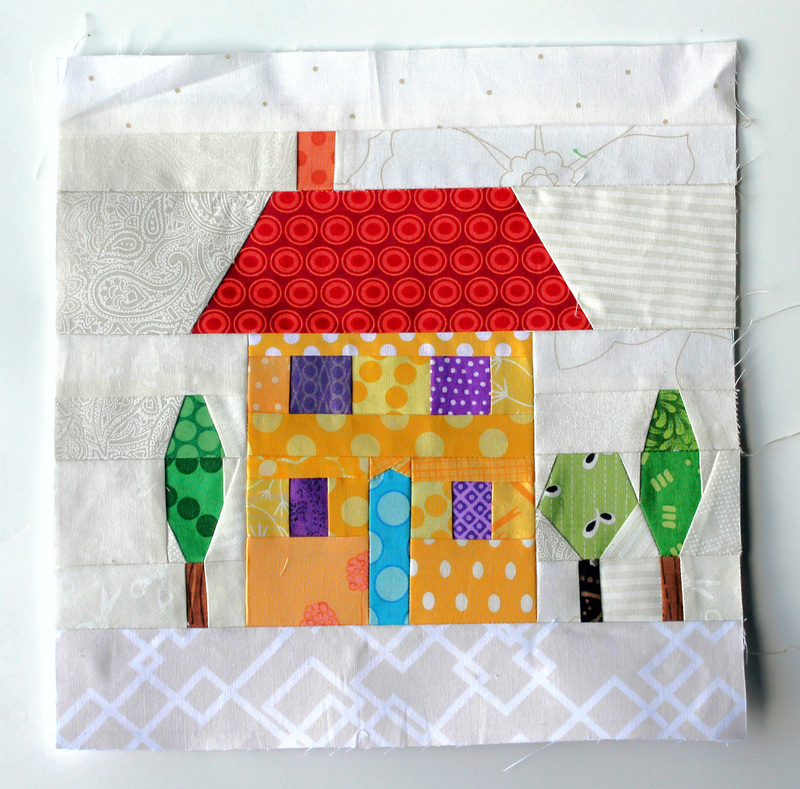 A paper-pieced house quilt feels very springlike to me. Maybe its the sunny yellow house combined with the excellent weather we are having. I love this! Can’t wait to see more. This is so cute! Thanks for sharing! My 6 year old daughter and I are working on making these today and yours was an inspiration for me! I can’t wait to see how they turn out! We just finished cutting up all out paper pattern pieces. Now on to the fun part of picking out fabrics from my ever growing scraps! You are so talented in your quilt making! What a wonderful activity to do together. I love it. The house is beautiful… tried it last weekend & think I have to do more now!!! Tank you for sharing it.